To Grow in Understanding is a weekly study/meditation resource for those seeking a deeper understanding of the Twelve Steps of Alcoholics Anonymous in order to strengthen their spiritual life. 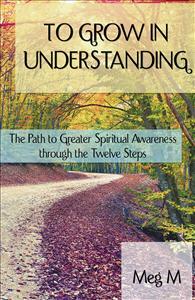 To Grow in Understanding is designed for those seeking a deeper understanding of the Twelve Steps of Alcoholics Anonymous in order to enlarge their spiritual life, the key to rich, joy-filled living. This weekly study/meditation resource is a practical tool to overcome doubts and fears and achieve freedom of the spirit. It is based on notes the author took during discussions with her sponsor, Jane H., for more than two decades, and thus reflects new insights gained over time by persistent application of spiritual principles. It captures the unique wit, humor and colorful language Jane used to deepen spiritual insights so that others can benefit from them.